Vor ein paar Tagen erst habe ich einen kleinen Beitrag zum „Oracle APEX 4.0 Cookbook“ geschrieben. Nun hat mir Packt Pub 2 eBooks zur VerfÃ¼gung gestellt, die ich unter meinen treuen Lesern verschenken darf. Wie kommt ihr an ein Buch heran? Ganz einfach, schreibt ein Kommentar unter diesen Beitrag, und teilt allen mit, weshalb ihr APEX einsetzt, oder weshalb es sich von anderen Technologien hervorhebt. Ich hoffe doch mal, dass mehr als 2 Kommentare abgegeben werden und deshalb entscheidet am Ende der Zufallsgenerator Ã¼ber die Gewinner. Denkt aber bitte daran, eine gÃ¼ltige Email-Adresse im Kommentar einzutragen, damit ich euch erreichen kann. EinsendeschluÃŸ fÃ¼r die Kommentare ist der 1. MÃ¤rz 2011, der Rechtsweg ist ausgeschlossen. 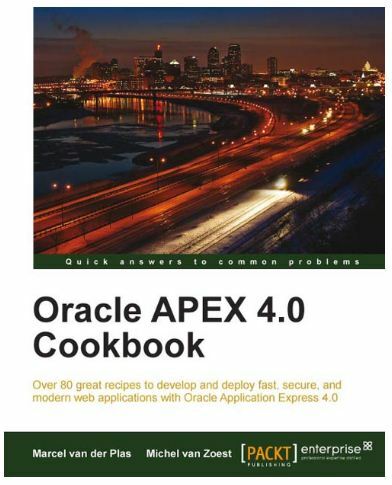 A few days ago, I made a small contribution to the written „Oracle APEX 4.0 Cook Book „. Now I Packt Publishing has made available two eBooks that I can give to my faithful readers. As you can match a book? Quite simply, a commentary writes this post, and inform all of the reasons she uses APEX, or why it stands out from other technologies. I strongly hope that more than 2 comments are submitted, and therefore ultimately determines the random number on the winners. Think but please remember to enter a valid email address in the comment so I can reach you. The deadline for comments is 1 March 2011, the decision is final. Dieser Beitrag wurde unter APEX, Bücher abgelegt und mit APEX, BÃ¼cher, verschenken verschlagwortet. Setze ein Lesezeichen auf den Permalink. Wir haben unser Laborinformationssystem mit Apex aufgesetzt. Damit kÃ¶nnen die Anforderungen, die sich aus der Laborpraxis ergeben, sehr schnell und flexibel umgesetzt werden. Wie agiles Programmieren. Und verbessern kann man immer. Why does APEX stands out from Other Technologies ? 3- Scalable as your Database is. 6- New APEX 4 Plug-ins ! Excited to get started on APEX ! I need this book!! Finally something we can trust and look to for Apex 4! Being a new Apex user this sort of resource is super helpful and invaluable once you have it. Examples are the best way I’ve learnt so far…lets keep it up! I’ve put up a link to your site on my own blog. Good luck with the competition and to the winners: have fun while reading the book and trying out the recipes. Why use APEX? Well, because it’s every PLSQL developer’s dream: a web-based RAD tool that is stored inside the database and produces database-centric applications. Talk about web technologies (the so-called web-stack) put on top of each other (Java-style!) to rapidly generate a good-looking web application, until all queries to the database are so abstract that nobody knows what why the DB is bottle-necked and an army of developers maintain tens of technologies! Forget about that, APEX should be the main development tool, when an Oracle DB is in the house. – with APEX 4.0, you can develop in teams, with TODO lists and milestones. Forget about Jira or Bugzilla, APEX has this functionalities too! Oracle DB is the best RDMBS put there. Why wouldn’t APEX become the best RAD tool, in the near future? please look at http://www.cc13.com/wordpress_21/2011/03/02/die-2-ebooks-gehen-an/ the most recent post. Oh! Congrats to the winners! leider nein. Der Verlag hatte mir 2 Exemplare zur VerfÃ¼gung gestellt und die sind raus.